Only the Interfolio Administrators at a client institution have access to the Interfolio Client Community. 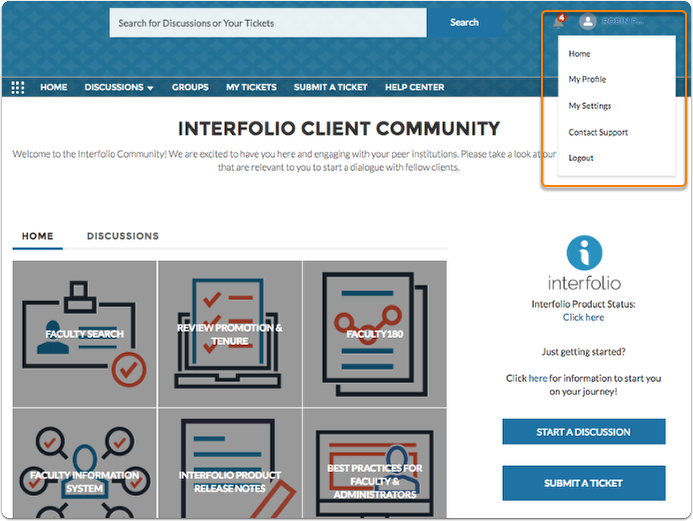 The URL for the Interfolio Client Community is https://myinterfolio.force.com/facultyfirst We encourage you to bookmark the URL. While on the product-help site, you can click the link at the top of the page, in the toolbar. Additional links to the Interfolio Client Community will be added to make access to the Interfolio Client Community easy for our institutional administrator users. 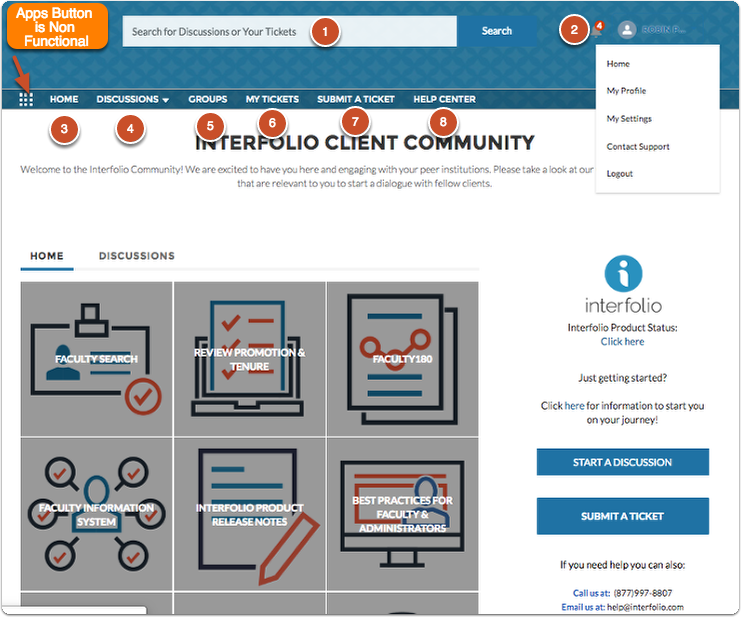 After you have logged into the Interfolio Client Community, you will be brought to the Interfolio Client Community dashboard. Here you can navigate to all parts of the Interfolio Client Community as well as to the helpsite. The Home 'notecards' links at the bottom half of the page will lead to central discussion points, including Release Notes, Faculty Information System, Best Practices, and more. For more information about the Discussions pane. On the right side in the image above you can see the contact information Scholar Services. Our agents are available to answer your questions, weekdays, 9am-6pm EST. Click the Discussions link to be brought to a quick way to view the discussions threads within the Interfolio Client Community. Clicking the Top Questions field will let you change the topics. On the left click the Top Questions drop-down field to see how you can filter the posts. On the right, you can click the filter to see specific types of questions. The tool bar is the main navigation piece and allows users to get to most places within the Interfolio Client Community. See the different ongoing discussions, by category/type. Note that the apps button, 9 dots, is not a functional button for institutional users. 2. The User Account Menu will let you access your personal and institutional information. 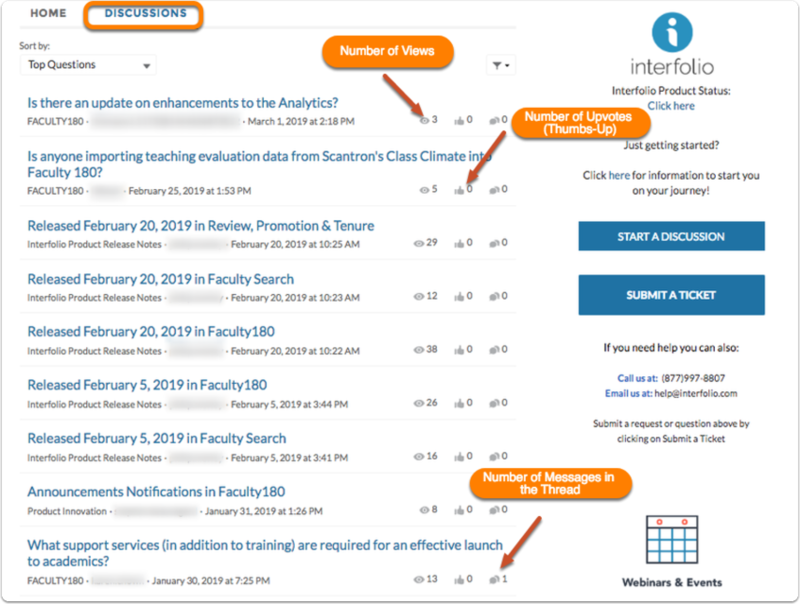 Located in the top right corner of the page, the user account menu in the Interfolio Client Community is the central location for users to access personal information and account information. Logging out of the Interfolio Client Community will not log you out of any Interfolio products. 5. Participate and join public and private groups. Share ideas, files, or processes based on similarities in the institutions. 6. 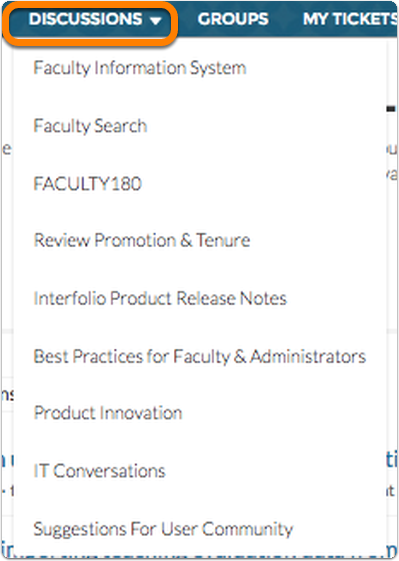 View your tickets and keep track of everything your faculty has reported to our Scholar Services team. 7. 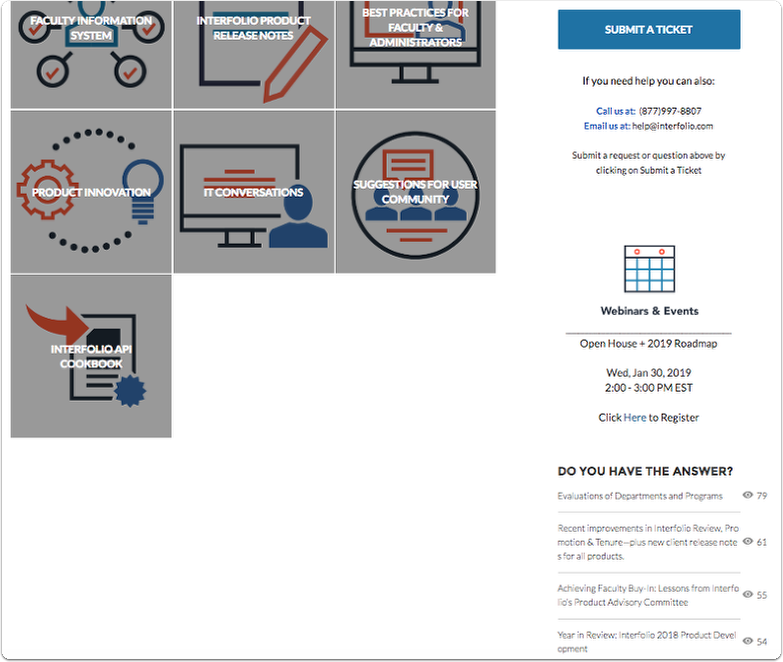 Navigate to the Help Center to read content like this to assist you further in the Interfolio Client Community, or the Interfolio products.